Call me boring but monochrome is my favourite starting point for outfits. Black and white photographs are so beautiful and inspiring, whilst monochrome clothing pieces are wardrobe staples that can be paired with any colour or style whilst remaining ‘in Fashion’, well, forever. However, as much as I adore my ‘basic’ wardrobe, every now and then it needs a little spruce up. For years I have been in denial regarding my pink obsession, and after much insistence from Peter I am willing to admit that yes I do love pink. Pastels are definitely not an original addition to our wardrobes, but worn in Winter they seem to have more of an edge than in the smouldering heat. I am always drawn to 60’s, retro styles, and whilst 70’s is having a huge influence on the Fashion world (rightfully so) I still like to remain faithful to my personal style. My Anya Sushko Berry Mini purse was the main influence on creating this outfit, alongside my new Missguided bargain from the sale. My make-up routine has been completely turned upside down since my recent clear out, and conscious opting to change my look. I have decided to swap my red lipstick for different shades this Winter and have picked a bright pink, alongside my Sally Hansen glossy pink nails in a deeper shade to contrast from the powdered pink and monochrome. The rings are old favourites that my Dad bought me from the seafront market last Summer, and I love wearing them. I love a collared dress as they are so feminine, particularly with the adorable polka dot print feature on this one. The baby pink leather jacket is from Dorothy Perkins last Summer, and was a huge staple when my hair was light blonde, however in a bid to not overdo the Barbie look I stopped wearing it until my hair was a darker shade. After Christmas I had a deliciously indulgent online shopping spree and found these New Look beauties. As much as I love thigh high boots on some people, they are not something I can pull off without looking unsavoury. These babies have a nice stiletto heel, fit nice and snug with a super soft suede exterior. My hair is having a nice detox. I have started sleeping with Moroccan oil soaking into the ends whilst wearing plaits. I am attempting to grow it out whilst being able to wear natural hairstyles free from heat (it’s the only way ladies). Tags: anya sushko, anya sushko purse, baby pink leather jacket, collared shift dress, grow your hair out, knee high boots, missguided sale, missguided shift dress, natural brown hair, natural hairstyles, new look sale boots, pastel biker jacket, polka dot shift dress, precious stone rings, south east bloggers, styling a shift dress, styling knee high boots, vut out shift dress, worthing bloggers, worthing fashion bloggers. Bookmark the permalink. Awww love the purse it’s so cute! You my friend are beautiful! I’m in love your outfit, I just want to pinch these items from you. My clothes are always a little more colourful or just black, think it’s time I tried a little more monochrome!? Monchrome is always my to go look. Not boring at all! I just love this look on you though, you pull in off so well you stunner! Love the pink lipstick, what shade are you wearing? I’m completely in love with your outfit! You look great in that collared dress. The pops of pastels are great. My favourite photos are in black&white too.Have a great Saturday! I love this outfit Jessica! you look beautiful. 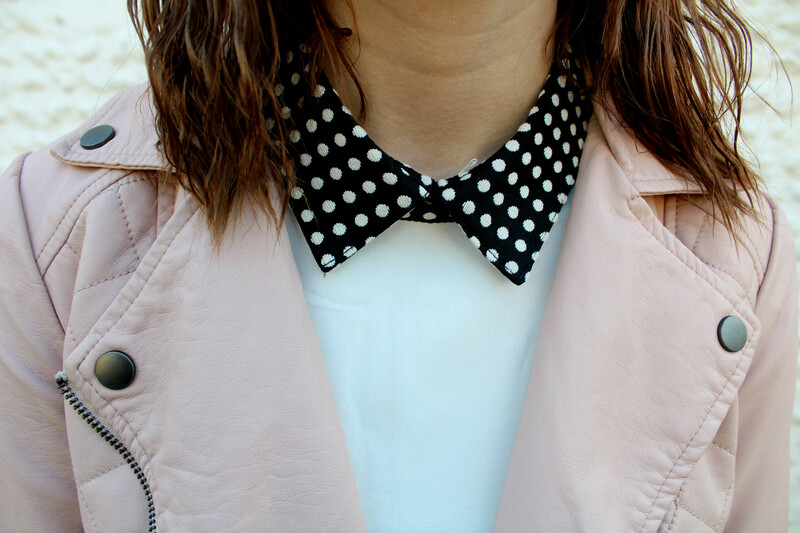 I love the polka dot collar!